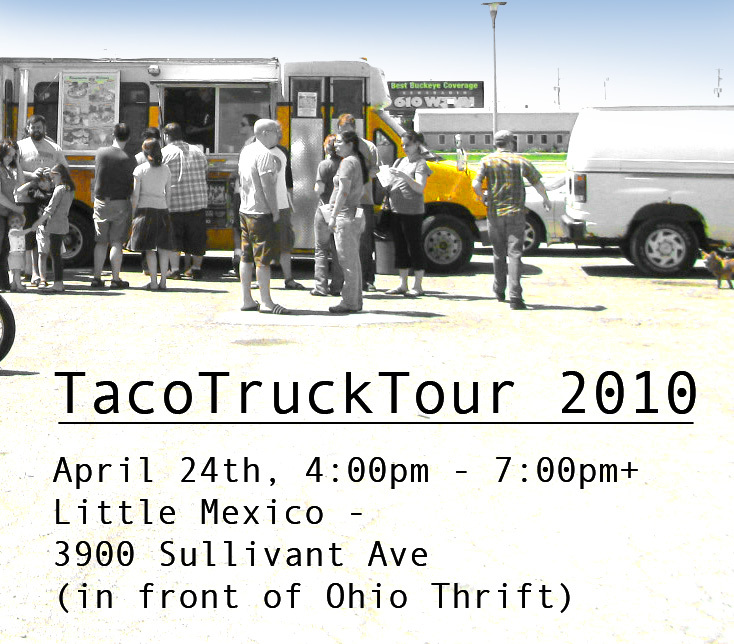 TacoTrucksColumbus.com - Taco Truck Tour 2010 (and after party) This Saturday! It’s coming up quickly, so we thought we’d provide a few updates and some advice on how to maximize your taco trucking enjoyment. First off, a big thanks to Hal and Al’s (on Parsons Ave) who have kindly offered to host an after party for the taco tour. For $8 you will get 4 different bottles of Mexican beer – Dos Equis Amber, Dos Equis Lager, Sol, and Tecate - in a Dos Equis bucket that is yours to keep. There will also be Jarritos Mexican sodas, for those who don’t want beer. Next item of business – unlike some of our events last year, there will not be a suggested donation for participation. However, we will provide the opportunity to make donations to the Centro Esperanza Latina (Center for Latin Hope), which is a community development organization that provides a great number of invaluable services for the Latino community in Central Ohio. Preparation for the event is minimal, but there are a few things to keep in mind. First, the trucks only accept cash, so please be sure to have some on hand (it shouldn’t take much). Second, we’re not sure what to expect for weather. We know that a few raindrops aren’t going to keep us from enjoying the day, but a rain jacket or umbrella might be worth keeping on hand just-in-case. We will have maps on hand at Taqueria Little Mexico to show locations for the trucks and tell a little about why each is special. All trucks are easily within a mile of each other. Welcome to the Germania's Bicycling Club! My name is Stephen Schneider, a member here at the Germania and an avid cyclist since my teenage years. A few seasons back, I started to lead bicycle trips around Central Ohio for our Germania members and friends to bring back the sporting aspect of our club's founders. When the Germania was founded, the original members enjoyed singing and soccer as a way to bring their immigrant community together. Well, almost 150 years later one still finds the singing portion of the Germania alive and well, but the soccer aspect is all but history. So, I decided to bring a more contemporary sport back to the club, one in which all ages and skill levels could enjoy - cycling! For the first few seasons, I wanted to see how well the members enjoyed this new addition to the club's activities and found it quite well received. Especially, since the main goal of each ride is to instill a sense of "Gemütlichkeit" among it's participants. That's a big German word for enjoying one another's company in a comfortable, friendly setting - which these rides are designed to provide. The potluck following each ride helps to instill a greater sense of Gemütlichkeit for all those who participate as well! May 23: The first ride of the season will follow the Olentangy Bikepath up to Antrim Park Lake from the Germania parking lot on the south side of the building. Following this ride, we will have a potluck picnic in our own grassy Bier Garten and enjoy a few grilled Brats (provided by me) to get the season off to a delicious start! June 13: This ride has become a seasonal favorite and caught us in a quite a shower a few years back! It follows the bike path from Yellow Springs to Xenia and is the only one that does not have a potluck picnic. This ride starts at the Train Depot in Yellow Springs and journeys down to Xenia and back. However, when we return to Yellow Springs everyone meets back at the Olde Trail Tavern on the main street in town for a bite to eat. So, please email me at the address given below, so I may let the friendly staff at the Tavern know an approximate number, thanks! Yellow Springs makes a nice day trip too and some get there early to shop, dine or take a stroll through the Glenn Helen. If you've never been there I can help suggest a few things to do before and after our ride, so plan on making a day for this one! July 18: The July ride will follow the Northern Alum Creek Pathway from Westerville to Easton and back. The park on Schrock road, in old Westerville adjacent to Alum Creek, will be our starting point and also the location for our potluck picnic. August 8: In the midst of summer we will enjoy a wooded ride in Amish country from Gambier to Danville, Ohio along the splendid Kokosing Gap Trail. Please assemble for the ride at the small Depot just below the town of Gambier across from the Kenyon College Athletic complex. The potluck picnic follows in the Waholding river valley at Rogers Cabin in the woods! September 19: It's early fall and we'll scatter a few leaves along the trail from Granville to Johnstown, Ohio. Please meet up at the back of Wildwood Park, just west of downtown Granville for the start of the ride. The potluck picnic will follow at the Hohman's farm, just north of Outville, Ohio near Granville. October 10: Well by now we should be enjoying the last of Indian Summer and this ride will follow the lower half of the Alum Creek Pathway in the Three Creeks Metro Park. Everyone needs to meet at the Sycamore Fields parking lot for the start of this ride. The post ride potluck picnic will be held at the Motika's home located near Obetz, Ohio. So, sounds like a summer of nice outings eh? Well I should hope so, with these fine paths to enjoy, along with one anothers' company at the post ride potluck it should be! All of the rides begin at 1:30pm the day of the ride at the location/park entrance described above. Please arrive sometime after 1pm to make sure your tyre pressure and any last minute necessities are in order. Helmets are encouraged for all participants and especially recommended for all children under the age of eighteen in attendance. Thanks for taking the time to check us out and we look forward to seeing you on a ride this summer! Until then, bis bald - Tschüß! (CNN) -- From Detroit to Denmark, the power of the pedal is generating electricity and energy conservation awareness. At a homeless center in Michigan, residents work out on 10 specially outfitted bicycles that send power back into the building. Female inmates at an Arizona jail take turns on a stationary bike to power their TV to watch their favorite soap operas. And this week, an upscale Copenhagen hotel began offering free dinners to guests who sweat it out on power-generating cycles. The use of human muscle generates mere fractions of the power required to run these facilities. But the sparks of energy are also inspiring environmental consciousness, say green fitness enthusiasts. People for Bikes - Sign the Pledge! We’re all united by a shared passion: bikes. Bikes keep us healthy, carry us from point A to point B, save us from high gas prices, and make our air cleaner and our roads less congested. Bikes fill our lives with adventure and excitement, relaxing our minds and energizing our souls. Working in the travel industry, I have the privilege to visit, explore, and read about some of the world's great destinations. I also have the good fortune to meet the people out there experiencing the trips and places we love. Witness 25-year-old Chip Albright, a Van Wert, Ohio, native who has been traveling the world for over four years and is currently over halfway through his quest to bike the Americas from north to south. We caught up with Chip via email in Baja, Mexico, on his way north toward the U.S. border after over a year in the saddle. You can follow Chip's progress toward his final destination, Prudhoe Bay, Alaska, at www.chipalbright.org. ed. note: Why am I posting this? Because I work with Chip's brother. I got to meet Chip here in Columbus on his break a few weeks ago. We had eleven show up at the start including two new riders. The cool story about the two new additions is they met on a Monday ride years ago (when the rides were actually a ride) and ultimately got married. But, they are frustrated by how the Monday rides are progressing and showed up to see what the Tuesday Night Ride is all about. We headed south from the park and rolled through town, jumping on the trail and headed down to Greenlawn. From there we made our way through the neighborhoods out to Demorest and ended at Big Run. There we raced up and down the hill a few times. The we headed north and ended up on Sullivant. From there we headed east and then took Souder up to the trail. From the trail we turned on 3rd and headed to Surly Girl. 24 miles total. No mechanicals. No much stopping, but a lot of riding occurred. Columbus Fitclique: We are our holding our second premier event- the Rock and Ride Spinathon in the Arena District May 8th from 7am-7pm. 100% of all proceeds go back to Nationwide Childrens Hospital- center for healthy weight and nutrition. Sponsors include: Roll, NBC4, Muscle Milk, Nationwide, lululemon, and Matrix.....Matrix is debuting the new Johny G Krank cycle and will have a master instructor on hand ( from San Diego) to demo the piece and do fusion classes...we will also have kids activities from Follow Me and Roll- after party will be at Park Street Patio with MGD 64. Monica Day is kicking off the event. Please get the word out about this...it should be an amazing event. 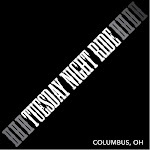 Fan Columbus Fitclique Rock and Ride Spinathon on Facebook to see details and a link that goes directly to the registration page on the NCH website. We have been selling Pedersen bikes and accessories since 1991. Ever since we have been trying to integrate technical developments related to bikes in our work - with pleasure! In 2002, we have relocated out frame production from Denmark to the Czech Republic. The Pedersen bikes are still assembled at the Roland Werk in Garrel, Germany. You will find products and news about the Pedersen bike on this homepage. SMIKE, the first bicycle with a sidecar, is a novelty. The innovative bike tour was developed in Switzerland and is changeable as a chameleon. According to the principle of "two in one bike" , a stable sidecar handles are attached to the bike with a few . So you can easily transport your purchases to drive comfortably in pairs or alone into the countryside through the city. SMIKE is TÜV-tested , radwegtauglich, maneuverable, comfortable, practical and flexible - when you go Smike?